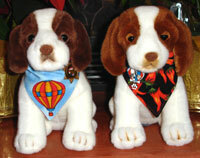 Your pet will adore our small bandanas! Read more information about our small bandanas. See what our customers have to say. 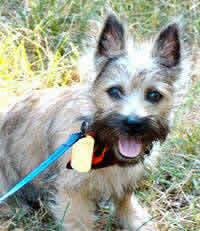 Shown on this page are some of our small bandanas and dog neckties we make, perfect for miniature dogs and cats. 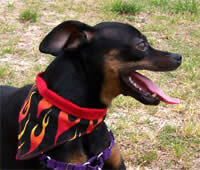 All of our small bandanas are reversible and available with velcro. 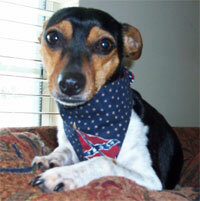 This bandana can be tied on tiny dogs or sew on snaps to custom fit. 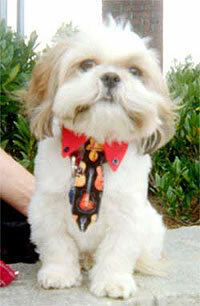 All of our dog neckties are custom made to fit. Copying our photos are prohibited. 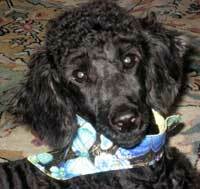 See all of our bandanas we offer for pets. These neckties are available in several fabrics we offer. 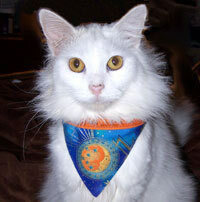 This standard size small bandana with 1/2" of velcro is perfect for cats. This bandana has a flag, bugle or drum design. 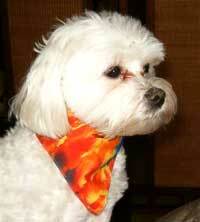 See the large dog bandana models page to view how this bandana looks in a size large. Great bandana for Re-enactment events! This small bandana can be used to dress up your stuffed animals or dolls.